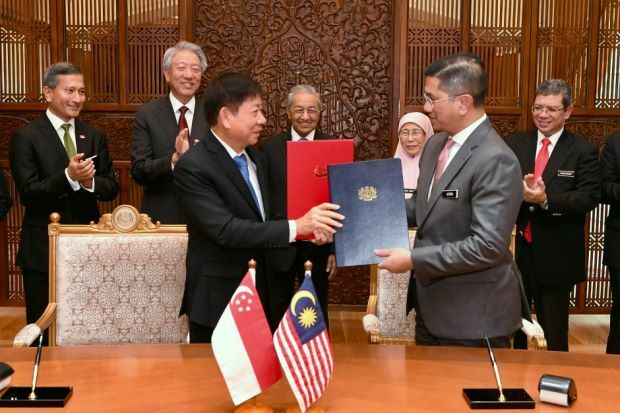 PUTRAJAYA: Malaysia and Singapore have agreed to suspend the construction of the High-Speed Rail (HSR) until May 2020 and will reimburse the republic S$15mil (RM45.1mil), says Datuk Seri Azmin Ali. The Economic Affairs Minister said the amount is to be paid by January 2019, as stated in an agreement to amend the HSR bilateral agreement. The terms were drawn out based on a new understanding between the new Pakatan Harapan administration and Singapore. In the event that the project does not proceed after the end of the suspension date, Malaysia will have to reimburse Singapore costs incurred in fulfilling the HSR agreement. This cost, however, has yet to be determined, said Datuk Seri Azmin Ali. Dr Mahathir had previously said that the project would be postponed and not cancelled as Malaysia could not afford to pay the compensation due to Singapore if the project was cancelled. "This is because Malaysia is committed to continue with the project after May 2020," he told reporters on Wednesday (Sept 5). The agreement was signed on behalf of Malaysia by Azmin while Singapore was represented by its Transport Minister Khaw Boon Wan. Prime Minister Tun Dr Mahathir Mohamad and Singapore Deputy Prime Minister Teo Chee Hean witnessed the signing. He had initially expressed his desire to scrap the HSR project due to cost concerns after claiming that it had inherited more than RM1 trillion in debt from the previous Barisan Nasional administation.